One of the things that annoyed me when I upgraded to Firefox 2 is the tab scrolling. As someone who has more than a dozen tabs open at any one time, I like to have them all in view. Now, before Firefox 2, excess tabs just had their tab widths shrunk, which still wasn't too helpful. 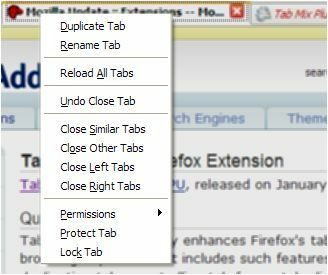 With Firefox add-on Tab Mix Plus, you have a dramatic improvement in tabbed browsing. Tabs are now displayed in tiers with handy "up-and-down" buttons at the side to scroll with. The page titles of each tab are clearly readable. A new command "Open Link in Foreground Tab" like in Opera is added to the context menu. For users of IE7 that want the one-click "New Tab" button in Firefox, Tab Mix Plus also incorporates that feature (it's that button at the top left with the green plus sign). There are dozens of other modification you can make to get Tab Mix Plus to behave the way you want it to. I highly recommend getting the development build since it incorporates the latest features. Using it thus far, it appears to be very stable.